For high-order continuum mechanics and classical field theories configurations are modeled as sections of general fiber bundles and generalized velocities are modeled as variations thereof. 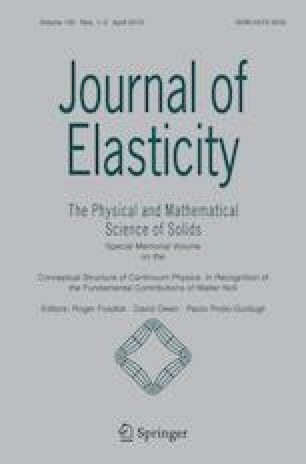 Smooth stress fields are considered and it is shown that three distinct mathematical stress objects play the roles of the traditional stress tensor of continuum mechanics in Euclidean spaces. These objects are referred to as the variational hyper-stress, the traction hyper-stress and the non-holonomic stress. The properties of these three stress objects and the relations between them are studied. Both authors are grateful to BIRS for sponsoring the Banff Workshop on Material Evolution, June 11–18, 2017, which led to this collaboration. R.S.’s work has been partially supported by H. Greenhill Chair for Theoretical and Applied Mechanics and the Pearlstone Center for Aeronautical Engineering Studies at Ben-Gurion University.